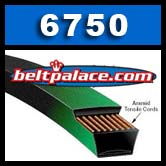 Gates 6750 PoweRated V-Belts. 50" OC x 3/8" W. Also known as 3L500K. Gates Premium 6750 FHP Kevlar belt for lawn & garden equipment.